This was one of those recipes that I couldn’t bear to say goodbye to, even after weeks of tastings and critiques. When Annie Petito finally nailed this recipe and it left the test kitchen to be surveyed by home chefs, I actually think I wept a little. Crispy outside, light and fluffy inside, and with a totally addictive, smoky-spicy “brava” sauce, these little nuggets are the definition of a binge-worthy treat! These tater bombs were made again for shooting TV just a couple weeks back, and after months of no patatas bravas in the test kitchen I must say there was a bit of a feeding frenzy when the episode wrapped and all the cooks and production crew descended on these babies like starving, wild animals. 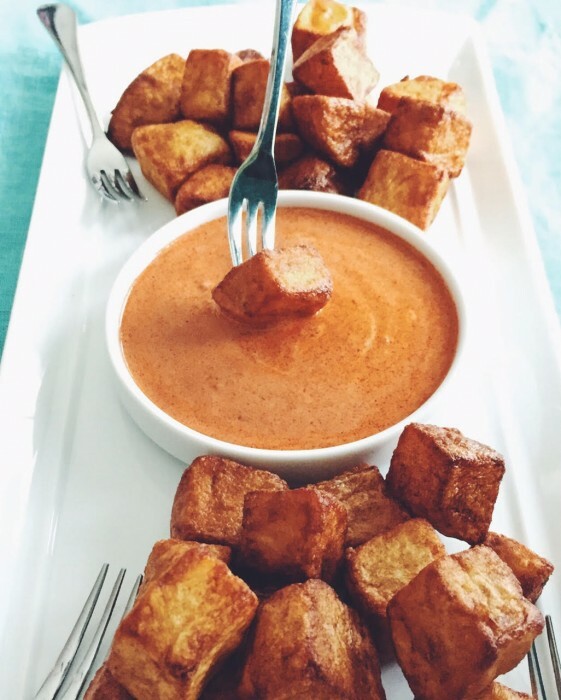 Having seen what these tots can do to people, when I made them the other day for my Mom’s birthday dinner I kept a bowl of them and some dipping sauce behind with me in the safety of my kitchen so I could avoid the risk of injury as folks formed a scrum around them in the living room. I would encourage you to do the same! FOR THE POTATOES: Bring 8 cups water to boil in large saucepan over high heat. Add potatoes and baking soda. Return to boil and cook for 1 minute. Drain potatoes. Heat oil in large Dutch oven over high heat to 375 degrees. Add all potatoes (they should just be submerged in oil) and cook, stirring occasionally with wire skimmer or slotted spoon, until deep golden brown and crispy, 20 to 25 minutes. Transfer potatoes to paper towel–lined wire rack set in rimmed baking sheet. Season with salt to taste. Spoon 1/2 cup sauce onto bottom of large platter or 1 1/2 tablespoons sauce onto individual plates. Arrange potatoes over sauce and serve immediately, passing remaining sauce separately.